DJs playing music simultaneously on an outdoor stage for a big crowd. Sounds like a recipe for a noise citation. But a new concept lets you customize your club experience, choose your own music – and dance away without disturbing the peace, thanks to specially designed headphones. It’s called Pin Drop Disco. Pin Drop Disco pumps up the volume like any nightclub. But if you happened to wander past Annette Strauss Square Friday night, you didn’t hear any bumping music. That’s because the 250 people dancing at Pin Drop Disco are listening to music on a special set of fancy headphones. They have three channels so you can choose your DJ, and you can also control the volume. The headphones light up with neon – a different color for each DJ. On Friday night, Sarah Jaffe spins with green lights, Zhora’s Taylor Rea wears red, and DJ emptycylinder has blue. As the DJs onstage “battle,” they could see who is listening to their channel and change up the music accordingly. And clubgoers can see what everyone else is listening to and change the channel. The silent disco idea started at European music festivals, says Ryan Dowd. Dowd owns the Nashville company Silent Events, which presented the dance party at Strauss Square. He says the silent disco is a better option than a regular club atmosphere mainly because crowds today are used to choices. The headliner for the night is DJ Spinderella of the hip hop trio Salt-N-Pepa. This is her first silent disco. She thinks it’s a fun concept that’s perfect for this era and gives the audience a more personalized experience. 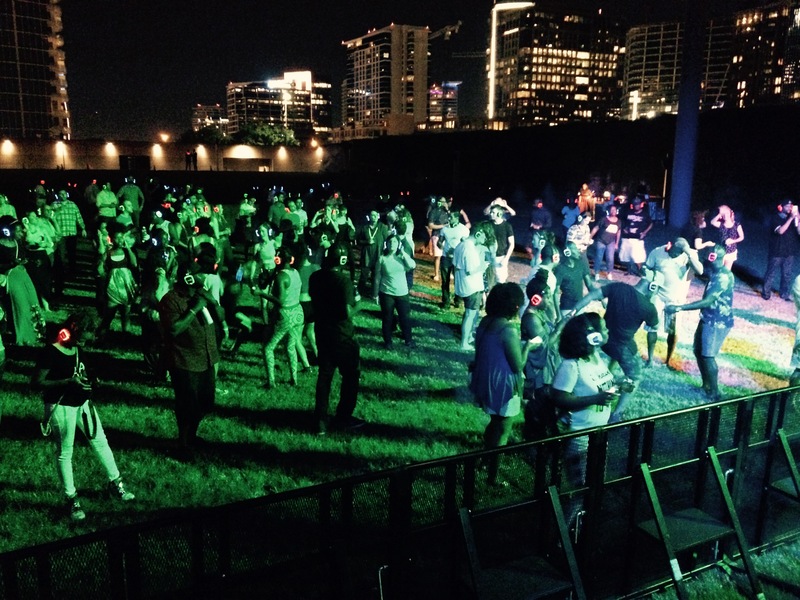 This kind of party seems to be catching on; Dowd said that there were four different silent disco events happening Friday night from Dallas to New Jersey. And if you think a crowd dancing with headphones on is a little well, weird, Dowd says the next trend is a silent wedding reception. I don’t know if that’s my kind of wedding, but I do know this is a pretty fun party – especially for the people wearing headphones and singing along to what they hear.